This book is the third in a series of volumes designed to enable those with a working knowledge of heraldry to identify medieval British coats of arms. Listed in this volume are entries from Chief to Fess. The project is the result of a bequest to the Society of Antiquaries in 1926 for the production of a new edition of Papworth's Ordinary which has remained, since its publication in 1874, the principal tool for the identification of British coats of arms. 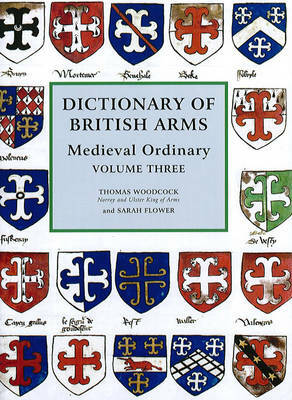 An Ordinary, in this context, is a collection of arms arranged alphabetically according to their designs, as opposed to an armory which is arranged alphabetically by surname. The present work is the third in a four volume Ordinary covering the period before the beginning of the heraldic visitations in 1530. Its publication will mean that the wide range of people interested in medieval arms - historians, antiquaries, archaeologists, genealogist and those dealing in and collecting medieval objects - will be able to identify accurately the arms that occur in a medieval context. Even those without a knowledge of the subject will be able, by means of the index, to discover the blazon of arms recorded under particular surnames in the Middle Ages.